Wedding Photos in Los Angeles Ca. What could be more romantic than a bride and groom lost in each other on the wedding day under the moonlight, it gives you shivers! This image is one of my favorites, just because of the challenges involved in getting it. Even though we’re San Diego based wedding photographers, we often travel outside San Diego to photograph destination weddings. This wedding was at a private wedding estate in Granada Hills in the San Fernando Valley, near Los Angeles. This photo demonstrates what can be done if the photographer isn’t dependent on camera mounted flashes. 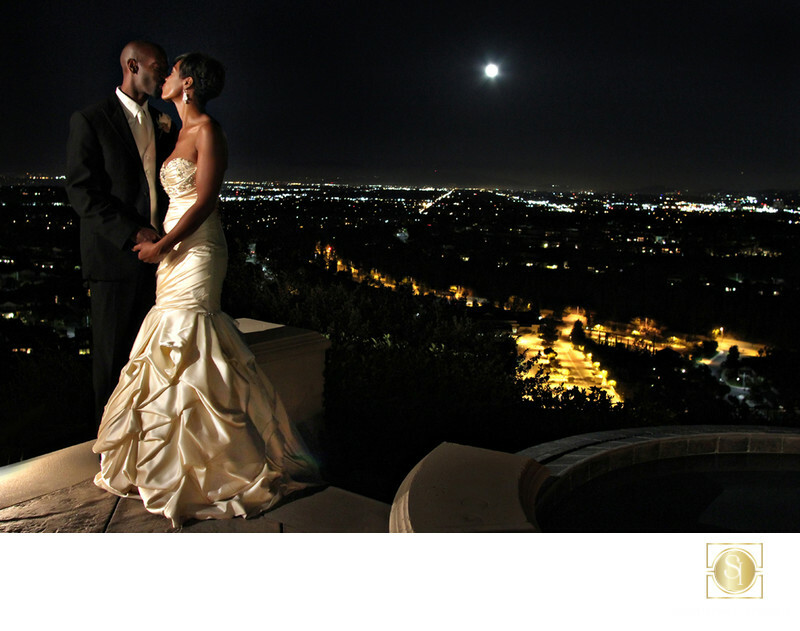 This wedding photo of the bride and groom alone was done with a single video light set to the left of the camera, so that the city lights and rising moon behind show brilliantly. The bride had requested a photograph of herself and the groom as the moon came up, but we couldn’t pry them away from their wedding guests until the moon had come up more than a little. I feel our use of nontraditional lighting combined with the amazing location made this a stunning artistic and timeless wedding photo. Contact us to see how we can do something amazing for you on your wedding day !